The Semi-Portable LFT-50 Landfill Tipper is designed for use at facilities that need the efficiency of a portable tipper that can easily move around the job site to accommodate your bulk product unloading needs. 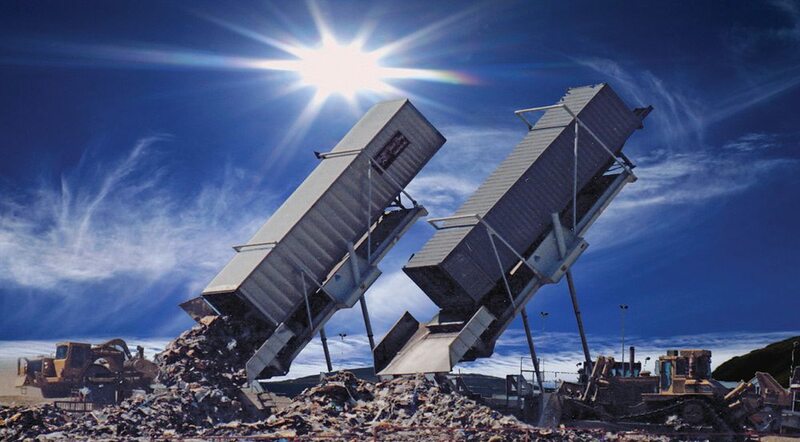 The Low Profile Landfill and Bulk Handling Portable Tippers are designed to be easily towed over the road to your site. Utilizing the Portable Low Profile Landfill Tipper model at your facility can save you as much as $100,000 in operating costs within your first year alone. With a 15 to 20 year average operating lifespan, that translates into millions of dollars of additional profit over the life of the unit. With the capability of dumping 10-12 trailers per hour, and an average 2 tons per trailer more over self-unloading trailers, you will generate more profit per load. Each Trailer Tipper is custom designed to be as versatile as possible to fit your needs. 50- and 65-ton units available. Constructed of welded A-36 steel, and custom built to lengths that accommodate your needs. Hydraulic and manual outriggers utilized for stability and ease of operation. Hydraulic power units built to operate all tipper functions, and your choice of diesel or propane engines. Cleaned to SPS-6 standards, primed and painted with durable automotive enamel. Custom colors are available. Four-axle spring suspension allows over-the-road transport and ease of onsite moving. The hydraulically-actuated rotating backstop rotates in and out of position to accommodate different trailer lengths, providing increased versatility.